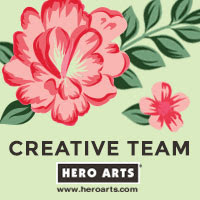 Hello there, today I am sharing another of my makes for the Stenciled Online Card Class. Day three was about creating texture with stencils. Debby Hughes made some stunning sample cards using embossing paste. As she is the one that got many of us into using embossing paste, I of course had to have a play and I have CASE's one of her cards. I have used the SSS Peppermint Stripe Stencil with white embossing paste and added this to one side of the card panel. I love the white on white look. I have cut a Memory Box Vivienne Butterfly from Doodlebug Gumdrop CS and added this to the panel after adding a little Wink Of Stella to it. The sentiment is from the Clearly Besotted Stamps A Little Sentimental set, which has been stamped on to white CS, cut out and popped up on 3D foam. I have then embellished with pearls and sprinkles. Thank you so much for visiting me today, I hope you are all doing well and having a lovely week so far. Love purple and white together and this looks great. I really must use my embossing paste, I bought it last March at the Hobbycraft NEC exhibition and haven't plucked up the courage to give it a go yet. Yours look fabulous. Oh wow Michelle. Great card! This is stunning Michelle. 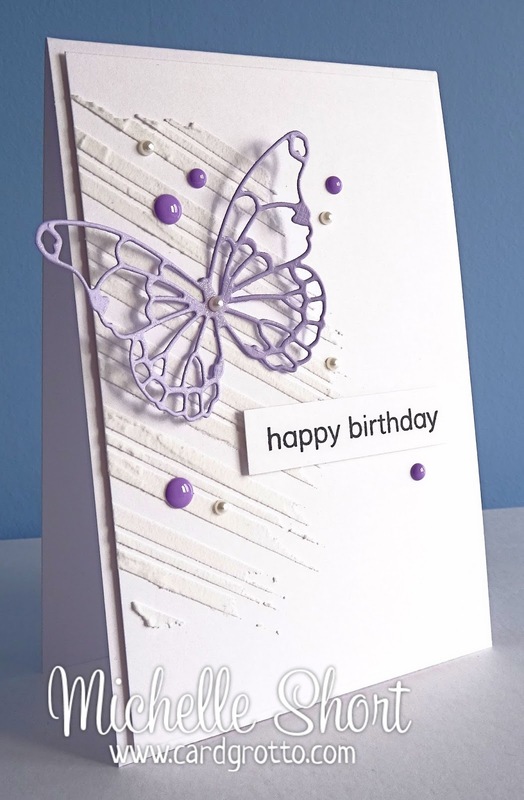 I love pretty lilac butterfly sitting on the embossing. The pearls and sprinkles are arranged so beautifully. WOW! This is drop dead gorgeous Michelle. Absolutely love it. Michelle, uour card is simply gorgeous! Love it! 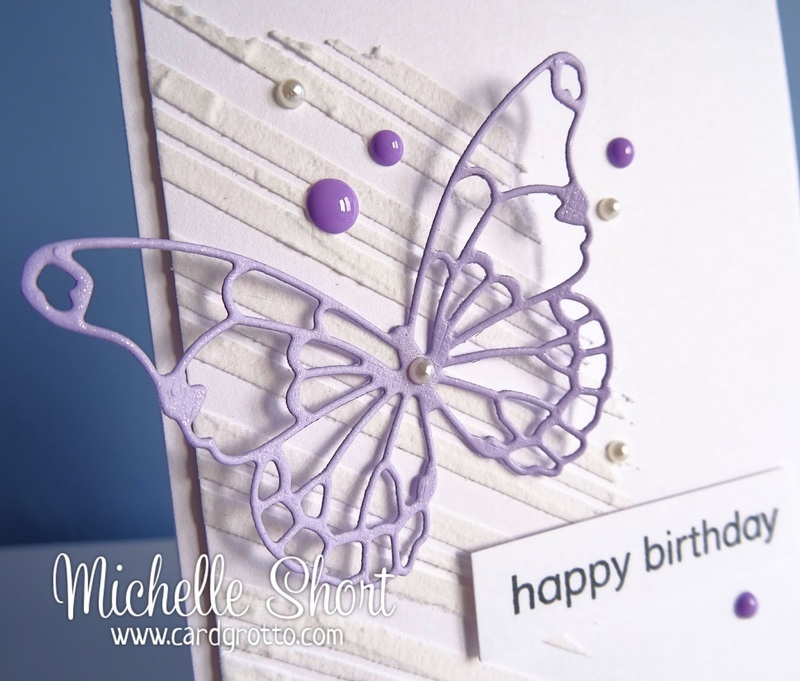 Beautiful CAS Card, Michelle ! 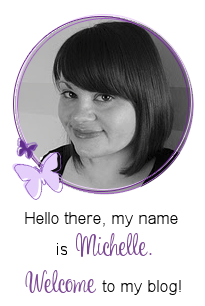 Michelle, Your cards are just gorgeous! I absolutely LOVE them! Your cards are gorgeous! I absolutely LOVE them! I thought I had subscribed to your blog, so I'll have to fix that right now...This card is gorgeous, Michelle! 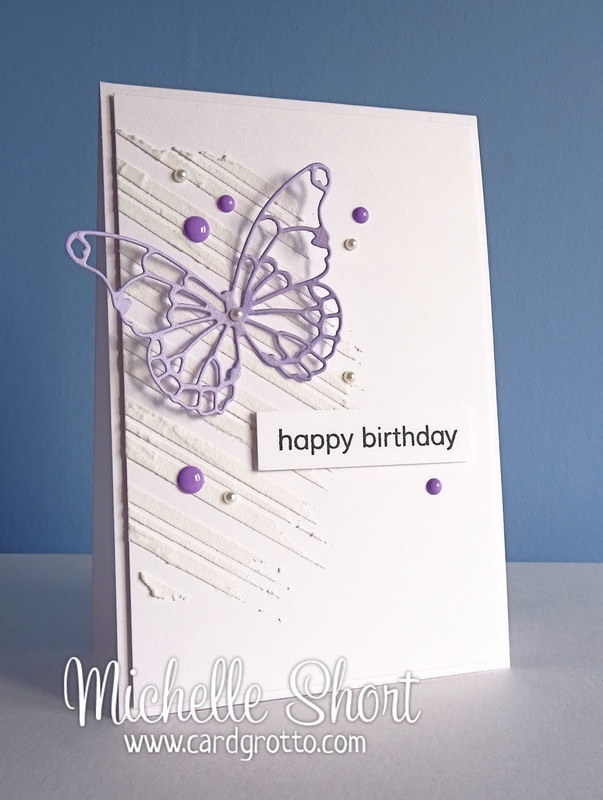 I love the peppermint stripe stencil with the paste...it looks great as a subtle background to your pretty butterfly! It takes a lot of skill to keep a card CAS when using paste, and you've done it very well! Beautiful card!